"Between the years 1972-74, before my grandfather died in 74', he brought me and my cousins, all boys, in his yellow '57 Chevy pick-up into the mountains. Us boys had sling shots and small bows and arrows. My grandpa would use a long pole to disturb the pack rats from their prickly pear cactus homes. We would tie strips of yucca lance shaped leaves together around our wrist with the rats hanging from their rear legs with their tendons keeping them in place. For dinner, my grandpa boiled, and fried them. They were white, sweet, and tender, a delicious delicacy. The rats were clean "being in the mountains" and their food being the sweet prickly pear cactus." "One thing is obvious, that teenagers are disrespectful towards the elders and the land and wildlife. The wildlife is less abundant on the reservation. My grandparents were wealthy from the cattle industry between the 30's and the 70's of last century. My parents were strict disciplinarians and my dad gave us a good work ethic, encouraging us to higher education. I see many of the younger generation just give up and are couch potatoes." 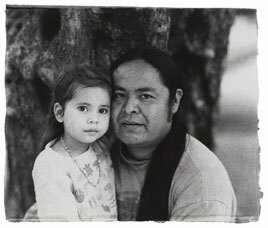 "I have participated in the healing ceremonies of the Apache Holy Grounds and hoping to learn the sacred 32 song. I help my friends, family, and relatives during the Sunrise ceremony or the Rites of Passage ceremony of a girl going to womanhood. My mother, aunts, grandmother, great aunts and sisters have gone through this ceremony. I have been a cowboy like my grandfathers, my father, and uncles. I respect my hunting traditions." "I must be a very handsome guy. Just kidding! It could be a recording for the photographer, maybe for the Arizona State Museum, or a museum art event. It may be possible to get a copy for myself, especially being with my daughter Srila. Me, and my little girl were pleased with the shot." "I've attended my tribal counsel meetings. I have seen struggles and difficulties presented, but the counsel members are doing a professional job of dealing with the constant obstacles. I'm in favor of our progress as a nation in these rapid-paced times." 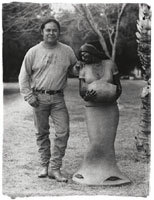 "Blue River Woman". What came to mind was that there is a flat plain near where I lived, nothing but cactus, rocks and desert. I was on horseback, and a box canyon came before me... about 200 feet deep and 600 feet across. Inside the canyon there was a stream of water the color of turquoise, with birds flying all over, trees, many petroglyphs... LIFE. The area was called Blue River. The water, and all the important sources of nature, inspired me to make "Blue River Woman."